Welcome to the website of St. John’s Anglican. We are a parish community whose mission is to celebrate and proclaim the love of God in Christ through worship, community, and service. Join us for Palm Sunday and Easter! will include a procession and the Anglican Morning Prayer liturgy. will include Holy Eucharist and a homily by The Rev. Jacque Hauser. All are welcome at both services! We live in a tech-saturated, disconnected, consumer-oriented society. At St. John’s, God is forming us into a very different kind of community. We have no bright lights, no screens, and no microphones. Our worship service is marked by the Spirit-filled ancient elements of Christian worship: the Word of God, prayer, song, and fellowship. We meet at the Lord’s table every third Sunday of each month with a visiting priest. So, if you’re looking for something different, a refuge from the hustle and bustle, a place to come as you are and taste and see that the Lord is good, we invite you to join us. We are a new church plant in Orinda, CA, serving the Lamorinda area and the East Bay. Our mission is to celebrate and proclaim the love of God in Christ through worship, community, and service. Our doors are open to all. 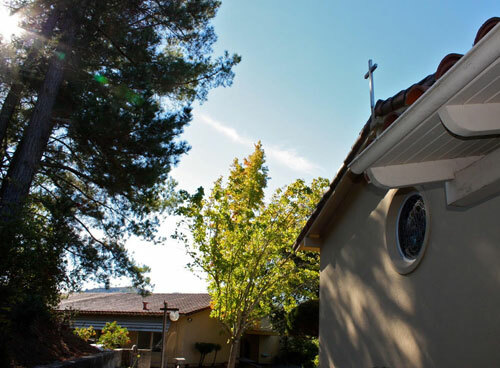 Join us for worship on Sundays at 10 am in the beautiful Santa Maria Chapel (walking distance from the Orinda BART station); and plan to stay after for coffee, refreshments, and conversation. As an Anglican church, we believe that the Spirit-inspired practices that Christians developed in the past still have the power to form us into a Gospel-shaped community of faithful Christ followers today. Thus our worship style draws from the deep well of Christian worship practice down through the ages, very much including the present. At St. John’s we love children. Families with Children make up nearly half of our congregation. What sets us apart from other churches is that we are committed to including our children in the worshiping life of the church. 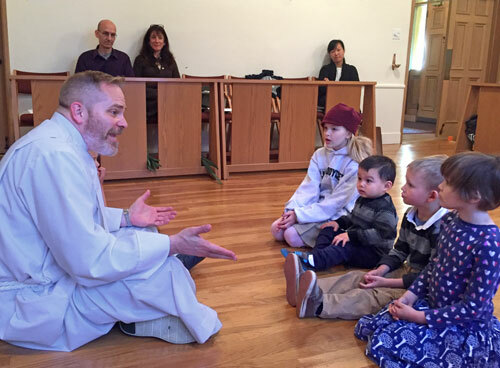 Our services include a brief children's sermon, a lot of interactive liturgy, and special activities for the kids. Why is it that we, as Christians, can give an enthusiastic ‘amen!’ to a sermon we hear on Sunday, but then find it nearly impossible to apply those lessons in our life the very next day at work or school? Why do many youths raised in the church go off to college and quickly lose their faith? Why is our faith so fickle? There are certainly a number of reasons in each individual case, but let me suggest one general answer you might not have thought of: The reason our faith is fickle is that the church is great at training brains, but we forget to train hearts – because we think that the heart is submissive to the mind. But it isn’t. The story of Jesus and the Canaanite woman is one of the most difficult passages in the Bible. It seems to depict our loving and merciful savior treating a mother in need in a way that is rude and even racially biased. As such, it provides us a powerful example of why the church needs to be very wise in how we interpret Scripture. With the help of historic interpretations of this passage and careful analysis of the biblical and historical setting, we will see that this story challenges the church with a powerful and humbling paradigm of racial inclusion through the grace of God. The story of Abraham and the binding of Isaac is a story that gives us a daunting picture of what true faith looks like. Where does Abraham get the eyes of faith to see a way forward when he receives one of the hardest of all callings from God? What does Abraham see with the eyes of faith that we cannot? And how can we come to see with the eyes of faith like that?